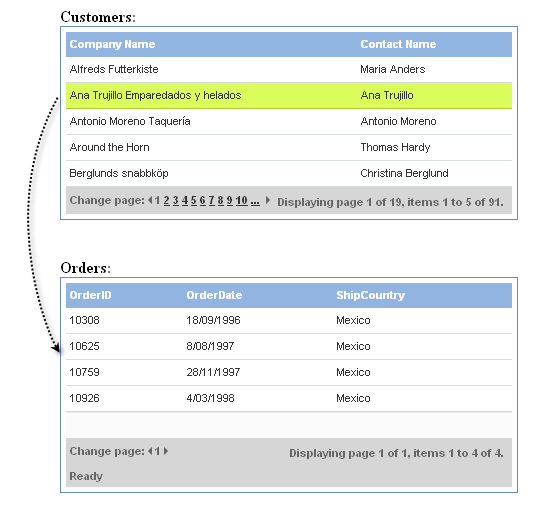 RadGrid provides support for master/detail relationships that use related grids which appear side-by-side, rather than nesting detail grids inside the records of the grid that displays the master table. Add each linking field from the master table (typically the primary key field names) to the DataKeyNames array of the related grid's MasterTableView. On the data source for the "connected" grid, construct a SelectParameter of type ControlParameter for each linking field. The ControlID of the SelectParameter should point to the related grid. The Name property should match a field name that was added to the DataKeyNames property of the related grid's MasterTableView. The PropertyName property should be "SelectedValue". Optionally, you can set the DefaultValue and Type properties as well. Alternatively, define similar SelectParameter using SelectedValues[''] where represents a column in the grid source. <telerik:RadGrid RenderMode="Lightweight" ID="RadGrid1" runat="server" AllowSorting="true" AllowPaging="true"
<telerik:RadGrid RenderMode="Lightweight" ID="RadGrid2" ShowStatusBar="true" runat="server" AllowSorting="True"
<telerik:RadGrid RenderMode="Lightweight" ID="RadGrid3" ShowStatusBar="true" runat="server" AllowSorting="True"
<telerik:GridBoundColumn DataField="UnitPrice" HeaderText="Unit price" SortExpression="UnitPrice"
<telerik:GridBoundColumn DataField="Discount" HeaderText="Discount (%)" SortExpression="Discount"
<asp:SqlDataSource ID="SqlDataSource1" ConnectionString="<%$ ConnectionStrings:NorthwindConnectionString %>"
ProviderName="System.Data.SqlClient" SelectCommand="SELECT CustomerID, CompanyName, ContactName, ContactTitle, Address, PostalCode FROM Customers"
<asp:SqlDataSource ID="SqlDataSource2" ConnectionString="<%$ ConnectionStrings:NorthwindConnectionString %>"
ProviderName="System.Data.SqlClient" SelectCommand="SELECT [OrderID], [OrderDate], [CustomerID], [ShipCountry] FROM [Orders] WHERE ([CustomerID] = @CustomerID)"
<asp:SqlDataSource ID="SqlDataSource3" ConnectionString="<%$ ConnectionStrings:NorthwindConnectionString %>"
ProviderName="System.Data.SqlClient" SelectCommand="SELECT [OrderID], [UnitPrice], [Quantity], [Discount] FROM [Order Details] WHERE ([OrderID] = @OrderID)"
<asp:ControlParameter ControlID="RadGrid2" Name="OrderID" DefaultValue="10643" PropertyName="SelectedValues['OrderID']"